'This was a man' - Shakespeare. Sham Lal, the veteran journalist and literary critic, who passed away in New Delhi on 23 February 2007 at the age of 95 indeed belonged to the classical age of classic Indian journalism. Sham Lal was born in 1912 in Ferozepur in the undivided Punjab and did his MA in English in 1933. His distinguished career as a journalist spanned over six decades. He joined The Hindustan Times in Delhi in 1934 and worked there for 12 years before moving to The Times of India in Bombay in 1950. During his tenure in The Hindustan Times, he became a great friend and admirer of Devadas Gandhi who was its Chief Editor. He joined the Times of India as Assistant Editor in 1950. Sham Lal was the Editor of the Times of India from 1967 to 1978. After his retirement, he continued as a columnist for The Times of India. In 1994, Sham Lal decided to stop writing for The Times of India and moved his column to the editorial page of The Telegraph. His relationship with The Telegraph lasted till his death. As a fearless and outstanding journalist, he belonged to the tradition of C Y Chinthamani, G A Natesan, Pothen Joseph, Krishan Das Kohli, J N Sahni, Devadas Gandhi, Frank Moraes, Khasa Subba Rao, Chalapathy Rao and many other luminaries who adorned the firmament of Indian journalism from 1915 to 1975. After joining The Times of India in 1950, Sham Lal started writing a very popular weekly literary column called 'Life and Letters'. Through this weekly column, Sham Lal became internationally known not only as a brilliant reviewer of books but also as a great scholar. To quote the appropriate words of Manish Chand, a journalist of today, in this context: 'An evening with Sham Lal, if you were lucky to have met this frail, benign bibliophile, will always burn bright in your memory. Not because he had a charismatic personality or that he had dramatic things to say. But because of his sheer pleasure in who he was: a rare solitude-loving creature who lived for books and the bliss of reading. 'Who imparted a new resonance to the post-modernist notion of the reader as the writer and creator of texts. Neither time nor age could stale his passion for books. Till very recently, he read for anything from six to eight hours a stunning variety of books which could range from stringent sociological analyses to most abstruse poetry'. When Octavio Paz, later a Nobel Laureate, was Mexican Ambassador in India, he became a close friend and admirer of Sham Lal. He referred to Sham Lal as -The brilliant Sham Lal... as deeply read in modern Western thought as in the philosophical traditions of India. When Octavio Paz passed away in 1998, Sham Lal wrote in The Telegraph: 'Now that Paz's life journey and poetic venture have come to an end, all that his friends among whom I am lucky to count myself, can do is to cherish the memories of their many encounters with him and explore further the meanings that can be read into the vast body of his work as a poet, a thinker and critic who used words as a tool in his life-long search for the word. His quest for the word with a capital W is not a matter of personal caprice. Poetic activity as he once wrote, 'is born of desperation in the face of the impotence of the word and ends in the recognition of the omnipotence of silence'. But, this is only a part of the truth. The raison d'etre of poetry, as of other forms of literature, is ending this dictatorship. 'It is man's only recourse against both meaningless noise and silence. That is why poetry which is the perfection of speech - language speaking to itself - is the invitation to enjoy the whole of life'. Though I had read and enjoyed some of his pieces on literature and men of letters in the Times of India from 1958 to 1963 during my days as a student in St. Stephen's College, Delhi, yet I never had the opportunity or good luck of meeting Sham Lal in person even once. About six years ago I was delighted to see a volume of his collected writings on 'Modern Thinkers, Poets, Playwrights and Novelists' under the title 'A Hundred Encounters' in the Higginbotham's Book Shop on Mount Road, Chennai and I bought that book and gulped it whole. This book falls into two sections. The first section deals with the works of great social scientists and historians who have had a significant impact on the political, cultural and intellectual landscape in the post-Second World War world. This section of the book grapples with modernity and discontent - a master theme that runs as leitmotif in his critical essays. Sham Lal refers to the 11 September attack on World Trade Centre in New York in these words: 'It is ironical that while America was planning to invest hundreds of billions of dollars in building a missile defence system, it did not realize that any of the thousands of airliners flying over its cities every day could be turned into such a weapon by a suicidal maniac with a pilot's license and armed with nothing more lethal than a box cutter'. What confronts the world today despite all the outward glitz and glitter of the products of new technology, is a far more inequitable order spurred by the globalization process, disrupted and hybridized local cultures, increased alienation of elite groups in the poorer societies from their own people and a menacing growth in fundamentalist terrorism. 'According to Sham Lal, the Soviet system created by Lenin, Stalin and his successors crashed because it could not cope with the on-going technological revolution. The new affluent society being created by the globalization process may come to grief because of its dizzy success in adjusting to it too well and its hubris. The second section relates to modern poets, playwrights and novelists. As a lover of poetry and literature I found this section to be absolutely beautiful and elevating. Lal's brilliant reviews of the literary productions of Samuel Beckett, W B Yeats, T S Eliot, Louis MacNeice, W H Auden, Ted Hughes, Bernard Shaw, D H Lawrence, Franz Kafka, Thomas Mann, Bertolt Breckt, Jean-Paul Sartre, Arthur Rimbaud, Boris Pasternak, Octavio Paz and many others clearly bring out the meaningful message of how to appreciate beauty in great literature with informed pity and generosity of spirit. For a man like Sham Lal with unquenchable passion for literature, literature, real literature, should not be gulped down like some potion which may be good for the heart or good for the brain - the brain, that stomach of the soul. Literature must be taken and broken into bits and parts, pulled apart, squashed - then only its lovely reek will be smelt in the hollow of the palm. It must be munched and rolled upon the tongue with relish. Only then, its rare flavor will be appreciated at its true worth and the broken and crushed parts will again come together in your mind and disclose the beauty of a unity to which you have contributed something of your flesh and blood. In 2003, a Second Volume of Sham Lal's collected writings was released. It carried the title 'Indian Realities - in Bits & Pieces'. His total understanding of the benevolent and malevolent forces at work in India today is indeed amazing. I have heard from many of his friends that Sham Lal was the centre, the life and soul of a circle of eager and delighted human beings, exuberant, endlessly appreciative, delighting in every manifestation of intelligence, imagination or life. He was life-enhancing in the highest degree. No wonder that even the most frozen monsters in our midst responded to him and, in spite of themselves, found themselves on terms of both respect and affection with him. Courage, candor, honesty, intelligence, love of intelligence in others, passionate interest in ideas, lack of pretension, tremendous vitality, warmth of heart, generosity - intellectual as well as emotional - contempt for the pompous, the bogus and the self-important these great qualities of head and heart marked him out as a fearless journalist for more than six decades. Fixed in the certainty of love unchanging'. 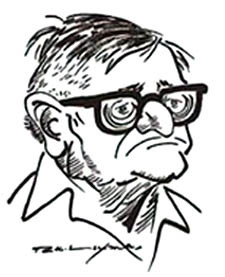 Image: Caricature by RK Lakshman from the book 'Indian Realties - in Bits & Pieces' by Sham Lal.